Objective Pancreatic cysts are commonly detected in patients undergoing pancreatic imaging. Better approaches are needed to characterise these lesions. In this study we evaluated the utility of detecting mutant DNA in secretin-stimulated pancreatic juice. Design Secretin-stimulated pancreatic juice was collected from the duodenum of 291 subjects enrolled in Cancer of the Pancreas Screening trials at five US academic medical centres. The study population included subjects with a familial predisposition to pancreatic cancer who underwent pancreatic screening, and disease controls with normal pancreata, chronic pancreatitis, sporadic intraductal papillary mucinous neoplasm (IPMN) or other neoplasms. Somatic GNAS mutations (reported prevalence ∼66% of IPMNs) were measured using digital high-resolution melt-curve analysis and pyrosequencing. Results GNAS mutations were detected in secretin-stimulated pancreatic juice samples of 50 of 78 familial and sporadic cases of IPMN(s) (64.1%), 15 of 33 (45.5%) with only diminutive cysts (<5 mm), but none of 57 disease controls. GNAS mutations were also detected in five of 123 screened subjects without a pancreatic cyst. Among 97 subjects who had serial pancreatic evaluations, GNAS mutations detected in baseline juice samples predicted subsequent emergence or increasing size of pancreatic cysts. Conclusion Duodenal collections of secretin-stimulated pancreatic juice from patients with IPMNs have a similar prevalence of mutant GNAS to primary IPMNs, indicating that these samples are an excellent source of mutant DNA from the pancreas. The detection of GNAS mutations before an IPMN is visible suggests that analysis of pancreatic juice has the potential to help in the risk stratification and surveillance of patients undergoing pancreatic screening. Pancreatic imaging tests (endoscopic ultrasonography and/or MRI/magnetic resonance cholangiopancreatography (MRCP)) commonly detect pancreatic cysts, but these tests do not reliably predict cyst pathology. Moreover, many cysts are too small to sample by fine needle aspiration. Better tests are needed to characterise these lesions. Secretin-stimulated pancreatic juice samples collected from the duodenum during upper endoscopy are used to diagnose pancreatic insufficiency, but these samples have not been evaluated as a source of mutant DNA from the pancreas. GNAS mutations are found in ∼66% of resected intraductal papillary mucinous neoplasm (IPMNs) but not in other pancreatic cystic neoplasms and so are highly specific for IPMNs. We found mutant GNAS in duodenal collections of pancreatic juice from individuals diagnosed with IPMNs just as often as in resected IPMNs, and almost exclusively in subjects with pancreatic cysts, including diminutive cysts (<5 mm), suggesting that pancreatic juice is a reliable sample for detecting molecular alterations in the pancreatic ductal system. We found mutant GNAS in some individuals before the emergence of a visible pancreatic cyst, indicating that GNAS mutations arise very early in the natural history of IPMN development. These results highlight the potential of using analysis of pancreatic juice with a more comprehensive panel of markers of pancreatic neoplasia to help in the surveillance and risk stratification of patients undergoing pancreatic screening. In the Cancer of the Pancreas Screening-3 (CAPS3) Study, we found that 84/216 (38%) of subjects screened had pancreatic cysts (mean size 0.55 cm, range 2–39 mm). Cysts were detected more often in older subjects (14% of subjects age <50, 35% aged 50–59, and 62% aged 60–69 years; p<0.0001).8 Subcentimetre pancreatic cysts are usually not resected, so information about their pathology is lacking. In addition, resected pancreata of screened individuals typically contain multifocal PanINs, in addition to IPMNs.16 Extensive PanINs may produce gland heterogeneity visible by EUS, but such changes are subtle and non-specific.17 Thus PanINs are only identified after histological examination of the resected pancreas. The inability to identify PanINs before surgery and our inability to characterise small pancreatic cysts highlight a need for novel diagnostic approaches to better characterise these lesions. One promising approach is to analyse pancreatic juice for mutations arising from the pancreas, a so-called ‘endoscopic pancreatic juice DNA test’. In this study, we used HRM analysis and pyrosequencing to measure GNAS mutations in secretin-stimulated pancreatic juice and evaluated its diagnostic performance in patients undergoing clinical pancreatic evaluation and subjects undergoing pancreatic screening for their family history of pancreatic cancer. Specimens and clinical information were obtained from 291 participants enrolled in the CAPS clinical trials.8 ,12 Subjects enrolled for screening in CAPS trials were asymptomatic with a family history of pancreatic cancer. The CAPS studies also enrolled disease control subjects undergoing evaluation for suspected pancreatic disease primarily to evaluate pancreatic juice markers. CAPS3 subjects were enrolled (2007–2009) at Johns Hopkins Hospital Baltimore, Maryland, USA (JHH), Mayo Clinic (Rochester, Minnesota, USA), Dana Farber Cancer Institute (Boston, Massachusetts, USA), UCLA (Los Angeles, California, USA) and M.D. Anderson Cancer Center (Houston, Texas, USA). For additional disease controls and to include individuals who had undergone serial pancreatic screening evaluations and juice collections, we included JHH subjects enrolled in CAPS2 (2002–2004) and CAPS4 (2008 to present). Most samples analysed in this study were from CAPS3 subjects (n=208), although not everyone who participated in CAPS3 provided samples. Fifty samples were from subjects enrolled in CAPS4, and 33 from CAPS2 subjects. Briefly, in CAPS2 and CAPS3, individuals were eligible for screening if they were from familial pancreatic cancer kindreds with three or more affected relatives with pancreatic cancer with at least one first-degree relative with familial pancreatic cancer or if they had Peutz–Jeghers syndrome (PJS).8 ,12 In CAPS4 (ongoing), we enrolled (i) individuals with PJS and (ii) individuals typically aged 50 or more with either (a) two or more blood relatives with pancreatic cancer and at least one first-degree relative with familial pancreatic cancer or (b) carriers of germline mutations with at least one close blood relative with pancreatic cancer. We referred to these screening risk groups as either (i) ‘familial’ or ‘strong family history’ or (ii) germline mutation carrier subgroups. In addition, in CAPS4, we enrolled subjects for pancreatic surveillance who participated in CAPS2 or CAPS3. Overall, 186 patients were enrolled for their family history of pancreatic cancer alone, two for PJS, and 22 with germline mutations (17 BRCA2, three BRCA1 and two p16). The CAPS studies are described in more detail elsewhere8 ,12 (and http://www.clinicaltrials.gov NCT00438906 and NCT00714701). The disease controls enrolled included subjects with (i) suspected pancreatic disease who had normal pancreata after pancreatic evaluation (n=20), (ii) chronic pancreatitis diagnosed by pancreatic imaging and clinical criteria (n=20), (iii) IPMN (n=24) diagnosed by either imaging or pathology (table 1), (iv) other pancreatic neoplasms (n=17; 14 pancreatic ductal adenocarcinomas arising in the absence of IPMNs and three serous cystadenomas, confirmed by surgical pathology). Secretion of pancreatic juice was stimulated by infusing intravenous human synthetic secretin (0.2 μg/kg over 1 min). Pancreatic juice was collected from the duodenal lumen over ∼5 min as it was secreted by suctioning fluid through the echoendoscope channel. Secretin was provided for CAPS3 and CAPS4 by ChiRhoClin Inc (Burtonsville, Maryland, USA), and for CAPS2 by Repligen Corp (Waltham, Massachusetts, USA).12 Juice samples were kept on ice until aliquoting and stored at −80°C before use. DNA was extracted from juice samples without additional processing (we did not separate cells) using the DNeasy Blood & Tissue Kit (Qiagen, Germantown, MD, ABI (Calsbad, CA)) and quantified by Quantifiler (Applied Biosystems). All elements of this study were approved by the institutional review boards of all participating sites, and written informed consent was obtained from all patients. Pancreatic imaging for CAPS and criteria used to diagnose IPMNs are described elsewhere.8 Imaging tests were performed blinded to each other. CT and MRI were performed before radial and linear EUS. After EUS, the endosonographer was unblinded to CT/MRI results. The CAPS group held a consensus conference on image interpretation and inter-observer concordance.8 Interesting cases were reviewed at case conferences. Our CAPS3 Study found that EUS and MRI/MRCP had excellent concordance (91%), and almost the same detection rate for pancreatic cysts (both superior to CT), with EUS the most sensitive test (further described by Canto et al 8). Therefore, when both methods were performed, we used EUS results to compare with GNAS results. Subjects enrolled in CAPS2 had pancreatic EUS but not MRI/MRCP. Cyst features (location, size, main-duct communication or involvement, septa, mural nodules) were noted. For some patients with many cysts (>10), counting may have underestimated the number of cysts. In some cases where there were many cysts, some subcentimetre cysts were not sized, so cyst size/location was described per the largest cyst. An increase in cyst diameter of ≥3 mm between baseline and follow-up examinations was defined as an increase in size. Subjects whose cysts increased in size and those who had new cysts emerge were classified as having cyst progression. Otherwise subjects were defined as having stable cysts. All imaging tests were performed before pancreatic juice analysis. Ten genome equivalents of juice DNA were dispensed into each well. For each patient's pancreatic juice sample, two 96-well plates of pancreatic juice DNA were analysed by HRM (180 wells, 1800 genome equivalents, for juice DNA; 10 wells for wild-type DNA; two wells for water). PCRs (5 μl) were performed with Platinum pfx polymerase (Invitrogen) and 0.1 unit/μl LcGreen+ dye (Idaho Tech). GNAS primers were 5′-GATTGGCAATTATTACTGTTTC-3′ and 5′-GGAGGAGGACAGCTGGTTATTC-3′. After PCR, plates were cooled to 28°C for 30 s to generate heteroduplexes, then subjected to HRM analysis (melt temperature 72–96°C; LightScanner mutation analyser, Idaho Tech). A fluorescence difference of 3% was set as a cut-off for identifying PCR products containing mutant DNA. To confirm HRM results, pyrosequencing was performed on PCR products from HRM-positive and HRM-negative wells and wild-type samples as previously described.30 A mutation score was generated for each sample (the number of positive wells with GNAS codon 201 mutations confirmed by pyrosequencing). The prevalence of GNAS mutation by disease group was compared by the Mann–Whitney test. Analysis of variance was used to compare mutant GNAS prevalence in cyst size subgroups. Paired t tests were used to compare baseline with follow-up mutant GNAS concentrations. Correlations between mutation score, cyst size and number were assessed by scatterplot and R2 value. Associations between GNAS and clinical variables were evaluated using Fisher's exact test or the χ2 test. Binomial logistic analysis was performed including variables with p<0.05 as covariates in the final model. Calculations were performed using SPSS Statistics V.17.0. p<0.05 was considered significant. The number of subjects in each diagnostic group is described in figure 1. Pancreatic juice GNAS mutations were detected in 50 of 78 patients with an IPMN (overall sensitivity 64.1%). In contrast with subjects with IPMNs, no GNAS mutations were detected in pancreatic juice samples from the 57 disease control subjects (normal pancreas, chronic pancreatitis and other neoplasms) (figure 2A). The IPMN group included 54 subjects who had undergone pancreatic screening for familial risk of pancreatic cancer, and 24 individuals with sporadic IPMNs. Two of the surgically resected IPMNs were main-duct IPMNs. All others were branch-duct IPMNs. There was no difference in mean age between those with IPMNs and disease controls (mean (SD) age 57.4 (15.2) years). Within the IPMN group, those with ‘sporadic’ IPMNs were older than those with ‘familial’ IPMNs (65.1 vs 59.2 years, p=0.009). Compared with sporadic IPMNs, pancreatic cysts were smaller when detected by screening (mean (SD) 6.8 (4.6) vs 17.3 (9.2) mm, p<0.0001). Sporadic IPMNs were more likely to be multi-loculated and to have mural nodules (table 1), consistent with their larger size. There were no significant differences between the sporadic and screening cyst groups with respect to other factors (data not shown). Summary of the study population. IPMN, intraductal papillary mucinous neoplasm. (A) Prevalence of mutant GNAS detected in duodenal collections of secretin-stimulated pancreatic juice by patient group. The intraductal papillary mucinous neoplasm (IPMN) group includes screened and sporadic subjects. (B) Prevalence of pancreatic juice GNAS mutations in screened subjects with diminutive cysts or normal pancreata (but not IPMNs). (C) Pancreatic juice mutant GNAS concentrations (mean mutation score) in subjects with pancreatic cyst(s) by cyst size. *=statistically significant (p=0.0063). The spectrum of GNAS mutations detected was 34.6%, 21.8% and 5.1% for R201C, R201H and both mutations, respectively. All but one of the patients with two pancreatic juice GNAS mutations had multiple cysts. Representative HRM analysis and pyrosequencing results are shown in online supplementary figure 1A. There was no significant difference in the prevalence or concentration of mutant GNAS detected between pathologically confirmed IPMNs (n=14) and image-diagnosed IPMNs (n=64) (prevalence 71.4% and 62.5%, respectively; concentration (mean mutation score) 4.3 and 4.6, respectively). As reported previously,29 there was no association between GNAS status and neoplastic grade in the resected IPMNs. The prevalence of juice GNAS mutations was not significantly different in those with small versus larger IPMNs; among IPMNs of 5–9 mm (n=40), 10–14 mm (n=17) and ≥15 mm (n=21), the prevalence of GNAS mutations was 62.5%, 58.8% and 71.4%, respectively (online supplementary figure 1B, supplementary table 1). The GNAS mutations in the resected IPMNs of the eight patients whose tissues were available for analysis were uniformly concordant with their corresponding pancreatic juice sample (figure 3). No GNAS mutations were identified in matching neoplastic and pancreatic juice DNA samples from individuals with pancreatic ductal adenocarcinoma (n=10) and serous cystadenoma (n=1). Confirmation of GNAS mutation in corresponding intraductal papillary mucinous neoplasm (IPMN) tissues. (A) An example of an H&E-stained (50×) IPMN with moderate-grade dysplasia before and after laser-capture microdissection. Microdissection was performed at the duct epithelial cell borders to avoid contamination with stromal cells. GNAS mutation R201C was identified in both a high-resolution melt-curve analysis (HRM)-positive well and DNA from the primary IPMN. (B) Microscopic images (100×) of intestine-type IPMN with high-grade dysplasia. GNAS mutation R201H was identified in both a HRM-positive well and DNA from the primary IPMN. (C) Microscopic images (100×) of a gastric-type IPMN with low-grade dysplasia. No GNAS mutations were identified by HRM, and wild-type GNAS was confirmed in DNA from the primary IPMN. WT, wild-type. Representative pyrosequencing traces are shown with mutant sequences highlighted by the arrows. We analysed diminutive pancreatic cysts (defined as cysts <5 mm diameter) as a separate group because these cysts are usually indeterminate and are not typically classified as IPMNs. EUS identified only diminutive cysts (without IPMNs) in 33 of the 156 individuals who underwent screening (table 2). Pancreatic-protocol CT detected cysts in only five of these 33 subjects. Fifteen (45.5%) of the 33 subjects with diminutive cysts had GNAS mutations detected in their pancreatic juice (figure 2B, online figure 1C). Of 123 individuals in the familial pancreatic screening group without a diminutive pancreatic cyst or IPMN, five (4.1%) had detectable mutant GNAS in their baseline pancreatic juice. 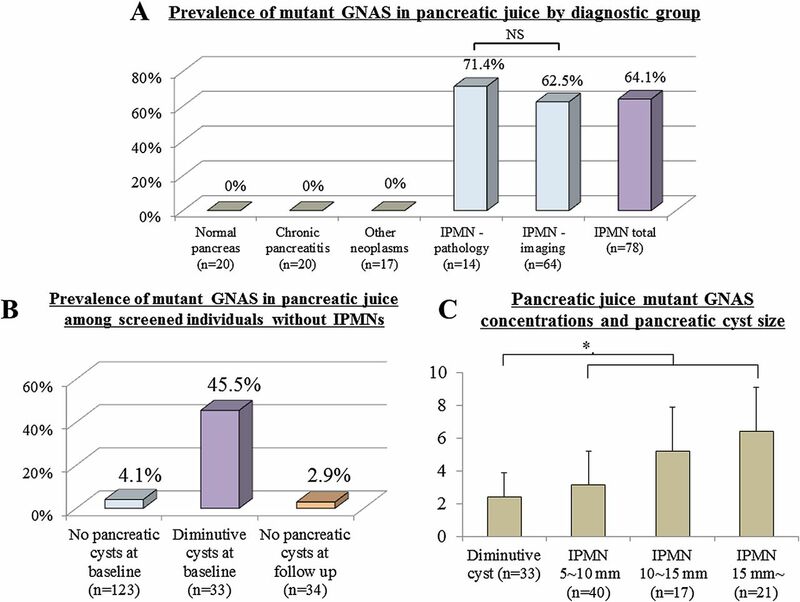 The concentration of GNAS mutations (mean mutation score) in pancreatic juice was significantly lower in the diminutive cyst group than in the IPMN group (p=0.0063, figure 2C). Among individuals diagnosed with sporadic IPMNs, the prevalence of pancreatic juice mutant GNAS was 75%, which trended higher than the prevalence in the familial screening group (59%, p=0.065). Of 111 subjects with pancreatic cysts, univariate analysis showed that GNAS status was associated with the presence of multiple cysts, septation status, cyst size (<4 mm) and patient risk group (sporadic vs screening group). By multivariate analysis, only cyst number was independently associated with mutant GNAS (table 3). There was no correlation between cyst number and GNAS concentration (R=0.03). Among those with pancreatic cysts, individuals with GNAS mutant were slightly younger than those with wild-type GNAS (table 3). Within the pancreatic screening group, those enrolled for their family history were more likely to have mutant GNAS detected than those with known germline mutations (58.4% vs 10.0%, p=0.0053). This difference was not associated with cyst characteristics. A multivariate analysis of the cyst-positive cases for factors associated with GNAS status confirmed familial risk category and cyst multiplicity as independent predictors of GNAS mutation status (online supplementary table 1). In addition, 15 subjects had cysts that had increased in size or number during follow-up. One subject's largest cyst had increased in size, but fewer cysts were detected. The prevalence of mutant GNAS in baseline pancreatic juice samples was significantly higher in subjects whose cysts increased in size compared with those whose pancreatic cysts remained stable (p=0.0311). Mutant GNAS concentrations did not differ between baseline and follow-up juice samples (data not shown). 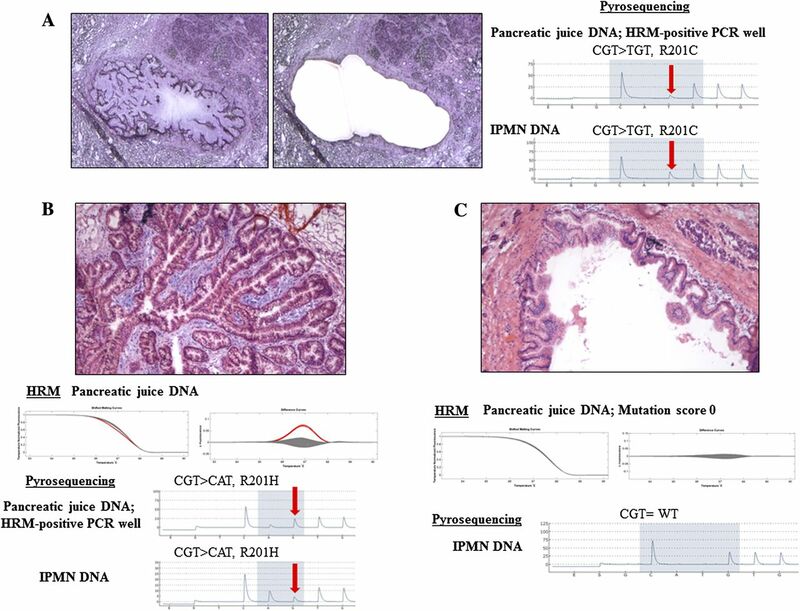 Our results indicate that duodenal collections of secretin-stimulated pancreatic juice provide a representative sample of pancreatic secretions that can be used to detect somatic mutations arising in the pancreatic ductal system. We base this conclusion on the high concordance between the detection of mutant GNAS in pancreatic juice and the diagnosis of IPMNs. Our prior work found that mutant GNAS is a specific marker of IPMNs; mutations are present in 66% of resected IPMNs, but not in other cystic neoplasms or pancreatic ductal adenocarcinomas that do not arise in an IPMN,29 and only rarely in PanINs.33 Combining such a specific marker with sensitive and accurate detection methods (HRM analysis/pyrosequencing) allowed us to evaluate the utility of using secretin-stimulated pancreatic juice as a sample for detecting mutations arising in the pancreas. The prevalence of mutant GNAS detected in duodenal juice collections from patients with sporadic IPMNs is similar to its prevalence in primary resected IPMNs and IPMN cyst fluids.29 Our results confirm the very high specificity of mutant GNAS for IPMNs; no one in the disease control groups (n=57) had mutant GNAS detected in their pancreatic juice. Another interesting finding is the prevalence of mutant GNAS in subjects who had only diminutive cysts, even 1-2 mm cysts. We found that mutant GNAS concentrations were higher in individuals diagnosed with IPMNs than in those with only diminutive cysts. This suggests that mutant DNA concentrations in pancreatic juice collections to some degree reflect the size of the GNAS-mutant clone(s) in the pancreas. Furthermore, among subjects with serial measurements, GNAS concentrations were almost always consistent. All subjects with mutant GNAS detected at baseline had the same GNAS mutation detected in their follow-up pancreatic juice sample. One patient with stable-sized cysts between baseline and follow-up pancreatic imaging had mutant GNAS detected in their follow-up sample. All other patients who had mutant GNAS in only their follow-up juice sample had new cysts emerge at this follow-up evaluation. Three of the four subjects with mutant GNAS in their baseline pancreatic juice but no pancreatic cysts at baseline were later found to have cysts at follow-up. Given the accuracy of our imaging tests, the chance that this imaging missed these cysts is low. This suggests that our mutant GNAS measurements were sensitive enough to identify lesions below the limit of detection of (or missed by) pancreatic imaging. The ability of pancreatic juice GNAS measurements to herald the subsequent detection of pancreatic cysts adds to existing evidence that GNAS mutations can occur in lesions too small to be seen grossly,33 and that these mutations then presumably drive the growth of these lesions. Overall, our results indicate that secretin-stimulated pancreatic juice samples collected in the duodenum during upper endoscopy are an excellent source of mutant DNA arising from the pancreatic ductal system. The frequent detection of GNAS mutations in subjects with only diminutive cysts indicates that GNAS mutations typically arise early in the natural history of an IPMN perhaps even before the development of a cyst. Since diminutive cysts have low malignant potential, the detection of mutant GNAS in pancreatic cyst or juice samples should not be an indication to resect the cyst. Criteria for resection should be concern for high-grade dysplasia or invasive cancer (such as the Tanaka criteria35). 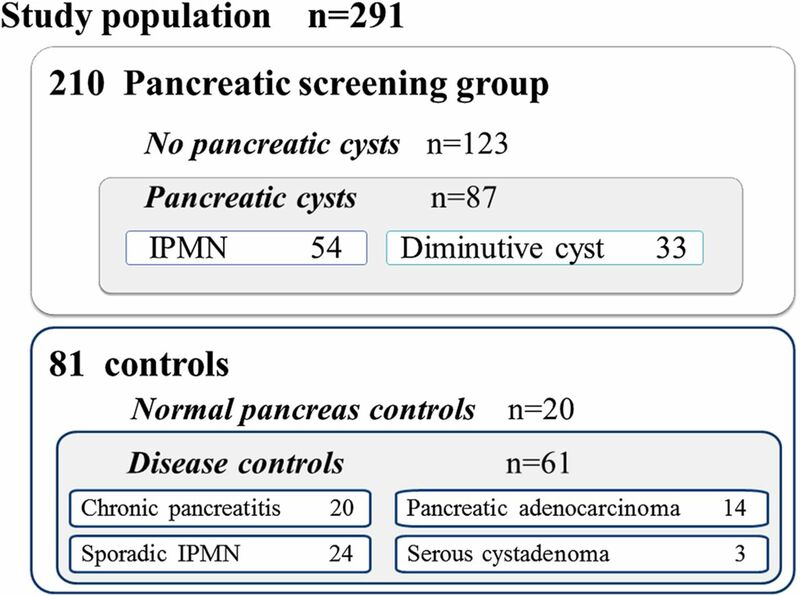 Current imaging modalities cannot reliably predict the pathology of diminutive pancreatic cysts.36 Pancreatic cysts of 5–10 mm are routinely recognised as IPMNs when they are observed to communicate with the pancreatic duct, but this feature is often not apparent for diminutive cysts. Although IPMNs evolve from smaller lesions, they are not categorised as IPMNs histologically until they are ∼1 cm.4 Since diminutive cysts are rarely resected, their pathology is not well understood. Some larger cysts diagnosed by imaging as IPMNs are found at resection to be serous cystadenomas or cystic pancreatic neuroendocrine tumours.13 ,34 ,35 Some individuals with small cysts have only PanINs, but not IPMNs, at resection,8 ,12 ,37 ,38 raising the possibility that some diminutive cysts represent PanINs. However, PanINs are not cystic neoplasms. PanINs are routinely identified in pancreata without an identifiable cyst and are much more prevalent than cysts.39 Instead, it is possible that extensive PanIN could partially obstruct small ductules, and the associated small ductule dilation could mimic a cyst. In our series, the prevalence of pancreatic juice GNAS mutations in the diminutive cyst cases was not significantly (45.5%) different after multivariate analysis from the prevalence among cases with IPMN(s) (64.1%). This suggests that most diminutive pancreatic cysts are indeed small IPMNs. We also found preliminary evidence for differences in the prevalence of mutant GNAS by screening group. GNAS mutations were detected more often in individuals with cysts in the strong family history subgroup than in our small number (n=10) of individuals with known germline mutations (BRCA2, STK11, CDKN2A/p16 and BRCA1). We suspect that many individuals in the ‘family history’ group carry germline mutations in other pancreatic cancer susceptibility genes that have yet to be identified. The infrequent detection of mutant GNAS in some individuals with numerous pancreatic cysts raises the possibility that some individuals develop pancreatic cysts by alternative mechanisms that do not require GNAS mutations. Since inherited susceptibility to pancreatic cancer is associated with germline mutations affecting many genes40 (including BRCA2, p16, the mismatch repair genes,41 STK11, and the more recently identified genes, PALB2 42 and ATM 43), it is likely that unique phenotypes and mutational profiles of familial pancreatic neoplasms are yet to be discovered. The burden of long-term surveillance for most patients with pancreatic cysts necessitates better surveillance strategies. The ability of GNAS measurements to herald the development of small pancreatic cysts (which are probably IPMNs) suggests that measurements of pancreatic juice GNAS can provide additional information beyond pancreatic imaging about the future risk of developing cystic neoplasms. The detection of mutant GNAS provides confirmation that detected pancreatic cysts are neoplastic, and, if no cysts are detected at the time of the evaluation, our results indicate that pancreatic cysts are likely to be detected in the future. Pancreatic juice analysis could complement FNA analysis, which is generally used to sample larger cysts (>1 cm). Ideally, pancreatic juice analysis would include markers that were accurate for identifying low-grade neoplasia such as GNAS, and others accurate for high-grade neoplasia. The absence of accurate markers of low-grade neoplasia would have the potential to predict a very low long-term risk of cancer, analogous to the negative predictive value of a normal screening colonoscopy. It is more important to have accurate juice markers for detecting high-grade neoplasia (PanIN-3 and IPMNs with high-grade dysplasia).44 ,45 Since PanINs cannot be reliably visualised with current tests and since most pancreatic ductal adenocarcinomas are thought to develop through the PanIN pathway, pancreatic juice analysis may ultimately provide the best evidence of PanIN short of resecting the pancreas. Our results demonstrate that HRM analysis combined with pyrosequencing to confirm mutations is an accurate method for detecting mutations present at very low concentrations (0.1% range). Some of the strengths of this study are the large sample size, the multicentre population, including subjects undergoing pancreatic screening and subjects with small and large IPMNs, and the prospective follow-up of some of our study subjects. A limitation of our study is the need to rely on pancreatic imaging to diagnose IPMNs too small to warrant resection. We also classified patient's cyst size by the size of the largest cyst, but other measurements such as the average size of all cysts would be more representative of pancreatic cyst burden. In conclusion, we find that the detection of GNAS mutations in duodenal collections of pancreatic juice is a highly specific indicator of pancreatic cysts, specifically IPMNs, and the prevalence of mutant GNAS in juice samples is similar to that observed in resected IPMNs. We also detect mutant GNAS even in juice samples from subjects with the smallest cysts, suggesting that secretin-stimulated pancreatic juice samples collected from the duodenum are a reliable sample for detecting mutations arising in the pancreatic ductal system. The detection of GNAS mutations in pancreatic juice before the emergence of a visible IPMN highlights the potential of pancreatic juice analysis to help in the surveillance and risk stratification of patients undergoing pancreatic screening.
. Main-duct intraductal papillary mucinous neoplasms of the pancreas: clinical predictors of malignancy and long-term survival following resection. Ann Surg 2004;239:678–85; discussion 685–7.
. An Illustrated consensus on the classification of pancreatic intraepithelial neoplasia and intraductal papillary mucinous neoplasms. Am J Surg Pathol 2004;28:977–87.
. Prevalence of unsuspected pancreatic cysts on MDCT. AJR Am J Roentgenol 2008;191:802–7.
. High prevalence of pancreatic cysts detected by screening magnetic resonance imaging Examinations. Clin Gastroenterol Hepatol 2010;8:806–11.
. Markers of pancreatic cancer: working toward early detection. Clin Cancer Res 2011;17:635–7.
. Frequent detection of pancreatic lesions in asymptomatic high-risk individuals. Subtitle: screening for early pancreatic neoplasia (CAPS 3 study). Gastroenterology 2012;142:796–804.
. Pancreatic cancer screening in a prospective cohort of high-risk patients: a comprehensive strategy of imaging and genetics. Clin Cancer Res 2010;16:5028–37.
. Detailed pathologic evaluation of non-invasive precursor lesions of the pancreas in patients with a strong family history of pancreatic cancer. Am J Surg Pathol 2006;30:1067–76.
. Age-related changes in the pancreas identified by EUS: a prospective evaluation. Gastrointest Endosc 2005;61:401–6.
. DNA methylation alterations in the pancreatic juice of patients with suspected pancreatic disease. Cancer Res 2006;66:1208–17.
. Molecular analysis to detect pancreatic ductal adenocarcinoma in high-risk groups. Gastroenterology 2005;128:2124–30.
. p53 and K-ras mutations in pancreatic juice samples from patients with chronic pancreatitis. Gastrointest Endosc 2001;53:734–43.
. Age- and disease-related methylation of multiple genes in nonneoplastic duodenum and in duodenal juice. Clin Cancer Res 2005;11:573–83.
. A highly sensitive and quantitative telomerase activity assay with pancreatic juice is useful for diagnosis of pancreatic carcinoma without problems due to polymerase chain reaction inhibitors: analysis of 100 samples of pancreatic juice from consecutive patients. Cancer 2004;101:2309–17.
. Quantitative assessment of telomerase activity and human telomerase reverse transcriptase messenger RNA levels in pancreatic juice samples for the diagnosis of pancreatic cancer. Clin Cancer Res 2005;11:2285–92.
. K-ras mutations in duodenal aspirate without secretin stimulation for screening of pancreatic and biliary tract carcinoma. Cancer 1999;86:1441–8.
. The early diagnosis of chronic pancreatitis. Clin Gastroenterol Hepatol 2008;6:1291–3.
. Endosonography-guided fine needle aspiration biopsy in the evaluation of pancreatic masses. Am J Gastroenterol 2002;97:1386–91.
. Assessing high-resolution melt curve analysis for accurate detection of gene variants in complex DNA fragments. Hum Mutat 2009;30:876–83.
. High detection rates of colorectal neoplasia by stool DNA testing with a novel digital melt curve assay. Gastroenterology 2009;136:459–70.
. Activating mutations of the stimulatory G protein in the McCune-Albright syndrome. N Engl J Med 1991;325:1688–95.
. Imprinting of the G(s)alpha gene GNAS1 in the pathogenesis of acromegaly. J Clin Invest 2001;107:R31–6.
. Whole-exome sequencing of neoplastic cysts of the pancreas reveals recurrent mutations in components of ubiquitin-dependent pathways. Proc Natl Acad Sci U S A 2011;108:21188–93.
. Presence of somatic mutations in most early-stage pancreatic intraepithelial neoplasia. Gastroenterology 2012;142:730–3.e9.
. Whole-exome sequencing uncovers frequent GNAS mutations in intraductal papillary mucinous neoplasms of the pancreas. Sci Rep 2011;1:161.
. Differential diagnosis of cystic tumors of the pancreas by endoscopic ultrasonography. Endoscopy 2009;41:684–9.
. ATM mutations in patients with hereditary pancreatic cancer. Cancer Discov 2011;2:41–6.
. MicroRNA alterations of pancreatic intraepithelial neoplasias. Clin Cancer Res 2012;18:981–92.
. Genome-wide CpG island profiling of intraductal papillary mucinous neoplasms of the pancreas. Clin Cancer Res 2012;18:700–12. Funding This work was supported by NIH grants (CA62924, R01CA120432, and RC2CA148376), the Lustgarten Foundation for Pancreatic Cancer Research, the Jimmy V Foundation, the Michael Rolfe Foundation, and Karp Family H H Metals, Inc Fund for Cancer Research Michael Hooven and Susan Spies. Material support: ChiRhoClin (secretin). Competing interests MG and RHH have a licensing agreement with Myriad Genetics for the discovery of PALB2 as a pancreatic cancer susceptibility gene. There are no other conflicts of interest for any of the authors. Recombinant secretin was provided for this study but the companies involved had no part in the design of this study, analysis or interpretation of data or in the writing of this manuscript. Ethics approval Ethics approval was provided by Johns Hopkins Joint Committee for Clinical Investigation.